Got a new Mac for Christmas and feeling a bit bewildered? Don't worry - this get-started guide from our colleagues on MacFormat magazine tells you everything you need to know. "I've got my new Mac, but all my stuff is on my PC…"
Well, just copy it over! If you have a USB or FireWire hard disk or memory drive that you use with your PC, simply drag the files and folders you want onto it, unplug it, plug it into your Mac, and drag them back off. You may be aware that Macs use a different disk format from PCs – HFS+ and NTFS – but this only prevents your Mac writing to a PC drive, not reading from it. Alternatively, connect to your PC over your home network to copy both ways. 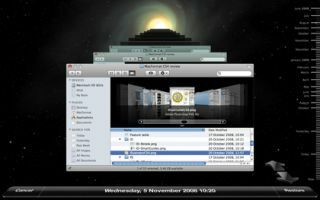 As in Windows, you have a home folder on your Mac (inside the Users folder, labelled with the username you chose) containing folders such as Documents, Pictures and Music. It's up to you whether you use these or make folders elsewhere. Just don't mess around with any other Mac OS X folders, such as Library or System, unless you know what you're doing. When you download a Mac OS X app, it usually arrives as a .dmg (disk image) file. This should automatically 'mount', appearing on your Desktop and in the sidebar of every Finder window like a disk drive. Open this. Some apps come with an installer, as in Windows; run this and enter your username and password when asked. However, many Mac apps just come as a program file, which you can move straight to your Applications folder. The easiest way is to drag it onto the Applications alias at the right-hand end of the Dock. Once the app copies, eject the volume and trash the .dmg. "How do I read PC file formats on my Mac?" PC files and Mac files are essentially the same. If you were running Microsoft Office for Windows, for example, and are now running Office for Mac, it will open all your existing files. If you've used fonts beyond the 'web safe' set – Georgia, Trebuchet, Verdana and so on – they may look different if you don't have the same fonts on your Mac, and in PowerPoint some animation effects don't translate. That's about as much trouble as you should have. One serious problem arises if you have macros in Excel. Macros may be used for anything from custom key shortcuts to complex automation. Spreadsheets containing macros in the outdated XLM language will still work in Excel for Mac 2008, but recent versions of Excel for Windows use Microsoft's Visual Basic (VB) instead, and Office 2008 for Mac doesn't support this. Although you can automate Excel for Mac using AppleScript or Automator, there's no way to convert VB. You could hunt down an old copy of Office for Mac 2004, which did support VB. Finally, if you use Microsoft Access, it's not available for Mac. You could install Windows on your Mac to run Access (for more see 'How do I transfer my programs?') or you could switch over to FileMaker Pro, the leading Mac database, and transfer your data by saving it in an intermediary format, such as Excel, and importing this into FileMaker. Intermediary file formats can also help with other exchanges. RTF (rich text format, .rtf) is supported by almost all text-handling apps; if even that fails, plain text (.txt) will get at least your words into any application. CSV (comma-separated values, .csv) serves a similar purpose for spreadsheets. There are even cross-platform formats for 3D graphics and CAD files.